In the netlist given as in the figure below we used one subcicuit to generate a simulated inverter using CMOS in Ngspice and another subcircuit for generation of a AND circuit and the connections made to obtain the outputs. 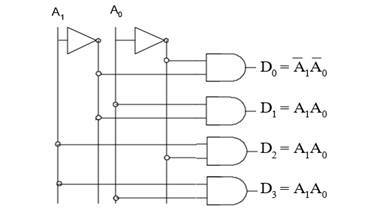 Let us discuss the operation and combinational circuit design of a decoder by taking the specific example of a 2-to-4 decoder. It contains two inputs denoted by A1 and A0 and four outputs denoted by D0, D1, D2, and D3 as shown in figure 2. Also note that A1 is the MSB while A0 is the LSB. As we see in the truth table (table 1), for each input combination, one output line is activated, that is, the output line corresponding to the input combination becomes 1, while other lines remain inactive. For example, an input of 00 at the input will activate line D0. 01 at the input will activate line D1, and so on. The circuit is implemented with AND gates, as shown in figure 3. In this circuit we see that the logic equation for D 0 is A1/ A0/. D0 is A1/ A0, and so on. These are in fact the minterms being implemented. 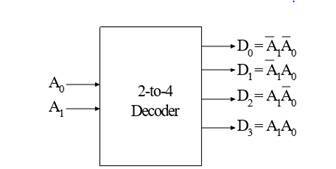 Thus, each output of the decoder generates a minterm corresponding to the input combination. Generally, decoders have the "enable" input .The enable input perroms no logical operation, but is only responsible for making the decoder ACTIVE or INACTIVE. * If the enable "E"
- is zero, then all outputs are zero regardless of the input values. -is one, then the decoder performs its normal operation. truth table (table 2). In this table we see that as long as E is zero, the outputs D0 to D3 will remain zero, no matter whatever value you provide at the inputs A1 A0, depicted by two don't cares. When E becomes 1, then we see the same behavior as we saw in the case of 2-to-4 decoder discussedearlier. this shows the theshold for 11 logic output at node 9 is high from the voltage 4.0 v similarly we can observe the thresholds for others output nodes.Here the standard version is providing a good range for logic 1. When we compare with the components they provided the cicuit with extra two not gates which results in increment of chip size and the time delay for the output. be 4.99ns which is 2ns less .